Recently a controversy erupted around a Florida Atlantic University course on cross-cultural communication in which students were asked to write the name Jesus on a piece of paper and then consider stomping on it. It ended up getting a reaction from the Governor of Florida as well as national news headlines. Here is an Orlando Sentinel opinion piece by Beth Kassab in which she quotes my reaction to the incident. It is a great perspective by her and I highly recommend it, even without my quote. If the Florida Atlantic University Jesus-“stomping” instructor was trying to make a point about religious tolerance, then point taken. Too bad so many people, including our governor, are missing the point. You and I may not like the classroom exercise that was intended to create discomfort — asking students to write “Jesus” on a piece of paper and then step on it. But you can’t say it didn’t make you think. On any other day, the instructor, Deandre Poole, would probably chalk that up as a success. What college teacher doesn’t want to push students to think about things in new ways? Instead he is being vilified as insensitive and crass for, ironically, trying to teach a lesson about sensitivity and civilized behavior. At least one student was so offended by the classroom exercise that he complained to Poole’s supervisor and got a lawyer to represent him, prompting Boca Raton-based FAU to apologize. Gov. Rick Scott called the student personally to apologize and has demanded a report on what happened. I won’t argue that this lesson lacked elegance. And taste. And I don’t know why Poole, who is also vice chairman of the Palm Beach County Democratic Party, chose to follow the suggestion in the instructor’s manual that Jesus be the focal point, when the same exercise could have been done with any number of other nonreligious symbols we hold dear, such as, say, the Declaration of Independence. The incident has, naturally, generated an incalculable amount of misinformation and outright lies, like the student being suspended because he wouldn’t step on the paper. Not true. The instructor’s manual for the textbook, “Intercultural Communication: A Contextual Approach,” advises teachers to have students write “Jesus” on a piece of paper and think about it. In other words, the point of this lesson was not to insult Christianity — the manual even anticipates most students won’t step on the paper — but to compel students to understand the power of certain words and symbols. Taking that a step further, because this is a course on intercultural communication, it’s likely meant to provoke empathy from students when people of other cultures or faiths are offended. It was a provocative exercise, yes, but that’s what the First Amendment and academic freedom permit in this country. When a Gainesville pastor wanted to burn a copy of the Quran, there weren’t any gubernatorial demands for an inquiry. Local pastors I talked with endorsed the FAU instructor’s point, if not the method. “Should we try to understand what it’s like to be a minority? Should we try to understand what it’s like to live in a culture unlike our own? That’s a very valuable lesson,” said the Rev. David Swanson, senior pastor at First Presbyterian Church in Orlando. “Picking a religious symbol was just an unwise choice.” Especially when it involves the central figure in the Christian faith. The Rev. Dan Lacich, a pastor at Northland, A Church Distributed, said he never would have stepped on the paper if he had been in that class. Sermon from Northland this past weekend on James 1:13-18. Enjoy the worship. The sermon starts at the 29 minute mark. Every once in a while a publisher or author asks me to do a review of a book and post it to my blog. They give me a copy of the book but there are no expectations as to what I will say about the book. Of course they are hoping I will say good things. In the case of Revealing Heaven by John W. Price, I can certainly say good things. Price has traveled an interesting road of faith. He was what I would call a mainline liberal Episcopal priest who become confronted by something far more mysterious and wonderful than he could ever imagine and it changed him forever. In his early days of ministry, talk of life after death seemed like so much pie-in-the-sky. What really mattered was making the lives of people better. The social programs of the 60’s fit very nicely with his theology. But God seemed to have other plans. Price was confronted by people who confided in him that they had died and experienced something wonderful before being resuscitated or even simply reviving without the aid of anyone else. At first Price found such tales somewhat embarrassing and uncomfortable. But for some reason he was confronted enough times and eventually by credible people that he knew something was up. He had to investigate. And investigate he did. He has spoken with more than 150 people about their experiences and come up with some fascinating similarities. The sub-title of the book is, A Christian Case for Near-Death Experiences. While Price is clearly a believer in Christ who has moved away from his early mainline liberal positions in many ways, he does not present a theology that all evangelicals will embrace. There is not the clear call for a faith in Jesus Christ in the way many evangelicals would think is needed in order to have a blessed near-death experience. But this is not about what happens to people when the finally die, only about what has happened to many who saw beyond the curtain of this life, encountered something/someone glorious who in most cases sent them back with a mission to accomplish or changes to make. But all was not beautiful light and pleasant encounters with the holy. Price talks about twelve people who had hellish near-death experiences. The accounts are often demonic and brutal. In a few cases the people who related the accounts experienced amazing change in personality and behavior. In some cases the person did not change, in spite of people warning them that what they say was their future in hell. This is a well written book taking the form of stories more than a theological treatise. That is part of it’s appeal. You get the stories of real people, recounted by a man who at one time discounted such talk of life beyond death. It is a small book but one I suspect with give encouragement and hope to many who read it. When you travel as much as I do and meet so many people from such different cultures and life situations, you are often blessed to meet people who completely stun you with what they are accomplishing for good in the world. As I head home from a trip to Uganda and South Sudan I am reflecting back on one such young man. His name is Michael. He is twenty-five and lives in Kwempe, a district of Kampala. 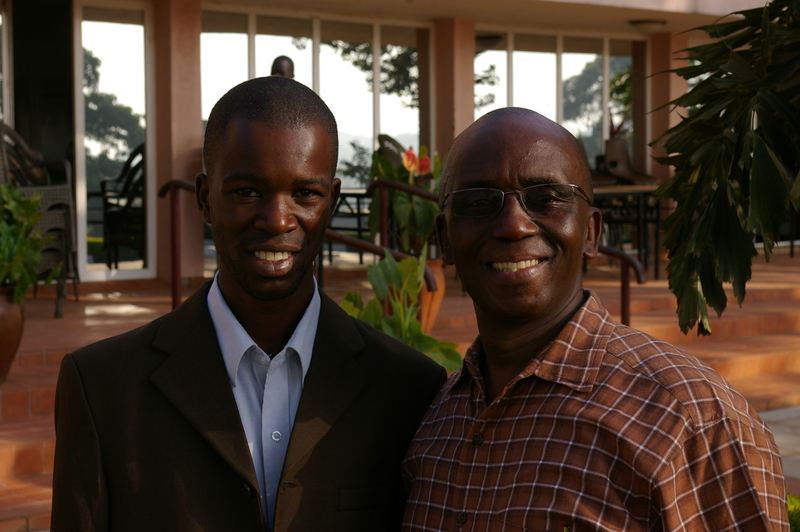 I first met Michael a year ago when we trained nearly 100 pastors and leaders to plant churches. It is all part of an effort at Northland Church to be a catalyst for 1 million new churches that are transforming their communities by making disciples who make a difference. We spend three days giving basic training in what we call Level 1. It includes Understanding the Bible, The Life of a Leader, and Planting Distributed Churches. Six months later we come back and do three more days on Basic Theology, Mentoring and Discipleship, and Reaching Muslims. We ask the participants to do all they can during that intervening six months to start at least two simple churches. A simple church is any gathering of a small number of Christ followers that regularly meets for worship and service of others, has recognized leadership, and considers themselves to be a local expression of The Body of Christ. In other words it is as much like a first century church as we can make it be. We have been doing this long enough to know that on average, 2.5 such churches will get started for every person we train. A few months after Level 1 Michael got to work planting his first simple church. He talked with some people he met, told them his story of coming to faith in Jesus and asked if they were interested enough to learn more and meet. They said they were and as a result a handful of people started meeting and came to faith in Christ. They became Michaels first church plant. The following week he met some more people and repeated the process, while at the same time continuing to guide the group from the previous week. The second group of people also became a new church in a new neighborhood. Michael continued this process every week. He would meet some new people, lead some of them to faith in Christ, have them begin to meet in a home or other location, disciple a leader or two in the group, and do it all over again the following week. In the course of the next seven months Michael started twenty-eight simple/house churches. That is on church a week for seven months! When I asked Michael how he does it, he replied in a very shy way that he just talked to people. Asked them about their lives and he told them about his and Jesus and asked if they wanted to meet to talk some more. When I asked what he does about visiting all twenty-eight churches each week he said he doesn’t need to do that. He stays in touch with the people who have become the leaders and disciples them. Simple and amazing all at once. Recently this young man has been approached by several people with years of ministry experience. They are asking him to disciple them so they can learn how to change their communities and the lives of people in positive ways. Michael is not charismatic in the popular sense. He really is somewhat shy and reserved. When we taked about what God was doing through him he seemed almost embarrassed. Clearly he did not like being the center of attention. What a refreshing and challenging person he is. When I made mention of Michael in a recent Facebook post, one person responded with, “Wow, makes me wonder what I have been doing for the past seven months”. In deed it does. Michael appears below on the left with my good friend Gus Davies who is a great partner in the training we do.